This week we had to create a look that was street chic, something that could be worn everyday that is still fashionable. I live in Minnesota and it is fall, so street chic to me is something that is warm and still looks good. So, I went with a look fall/early winter look with a little bit of a rocker edge. I started with a slim, textured leather pant, then topped that off with a knit tunic with a scarf sewn right in the neckline. The scarf can be folded in half width-wise and just hung down the back, wrapped once or, for really cold days, wrapped twice. Over the tunic I added an over-the-top furry, cap-sleeve vest. I played with the lengths at bit and made it shorter than the tunic. 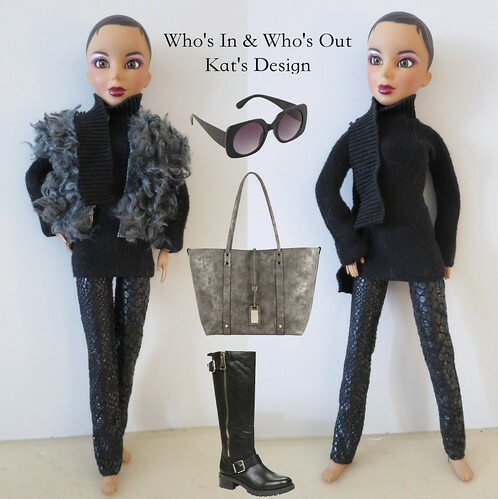 From the accessory wall, I added some heavier boots, a silvery grey bag and some big sunglasses. I think the whole thing comes off as very casually chic. This is a girl who knows how to laugh at cold weather and still look good. Oh, the judges…I’m afraid they would feel this comes a little too close to what I’ve shown a few other times this season (especially last week’s look). Still it is a pretty put together look and really meets the challenge. Is it high fashion? No, but this is supposed to be something that could be worn everyday. I think Heidi would love the playfulness of the vest and Zac would find the pieces well made. Nina might complain that she has seen it. Still I would stand up for this look and think I’ve made it to Fashion Week. 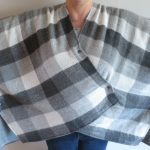 5 years ago by Kat in Challenges , Needlecraft , Project Project Runway , Sewing | You can follow any responses to this entry through the RSS feed. You can leave a response, or trackback from your own site. I agree. Going to the well one to many times but it is a well put together look. Those embossed leather pants will advance you to the next round for sure. Well done and congratulations on advancing to Fashion Week. At this point in the season, it gets hard to come up with new ideas 😉 I know, that is no excuse.